I couldn’t wait to cast on for the mohair scarf yesterday. I love the colors in the hank and I couldn’t wait to see them stripe up. Isn’t that the fun part with hand-dyeds? Instead of striping the colors are kinda blending, and the green seems to be alot stronger than I had hoped. I really don’t care for brighter greens so I tried mixing in some other yarns to temper it. proof that more is sometimes less. That’s not doing it either. So I’m not sure what to do with it just yet. I like the pinks, reds and oranges in it. 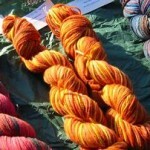 Maybe a monchromatic hand-dyed in subtle pink/red/orange variations? 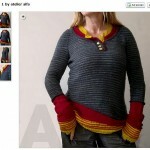 Or maybe striping it with black – a few rows of black, a few rows of the mohair? What do you think? I still like the yarn, but I’m really not sure what to do with it. Heya I have more questions! I posted an entry to my blog if you have time to take a look. I am nearly done with the back! also I like the first p icture of the scarf. Why not mix in some redish or blueish eyelash to mask out the green? Sorry the mohair isn’t knitting up as you would have liked. My mom was a wonderful knitter (I’m upset that she never taught me how to read patterns)who used to make me designer sweaters. One memorable sweater was mohair. It had a different color yolk than the rest of the sweater. It also had ragland sleeves with elastice running through the cuff portion so that the sleeve had the same color as the yolk. Are you understanding what I am explaining? Anyway, I think you would look good in a sweater like that. You would have a wide variety of colors to use for the rest of your sweater. I’m thinking that the rest of your sweater doesn’t necessarily have to be mohair but I think that is what I think would look good. So that’s my idea. Have fun coming to a decision! At sheep and wool they had hats made with one strand of boucle held together with one strand of sportweight/sock yarn. 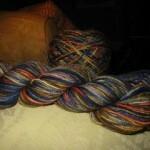 Neither yarn was a solid but the colors complimented each other enough that it looked great. 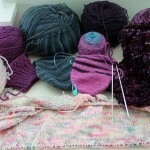 Another option would be knitting it up with a ribbon yarn. There’s a Katia yarn (Seville maybe?) which is a thin, solid colored, shiny ribbon that looks really good coupled with mohair. Don’t you hate when your yarn just doesn’t behave as you’d hoped! Maybe you need to do something really simple with the yarn and not try to make it do something it clearly isn’t suited for. I had the same problem with some mohair I was knitting up. a simple slip stitch scarf ended up showing off the colors to best advantage with the least amount of fuss. 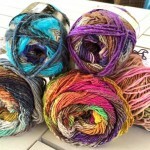 If you want to tone down your yarn colors I’d combine with a medium or charcoal grey yarn rather than black. Of course, your mileage may vary! I’s a lovely yarn and I’m sure you’ll find a perfect use for it.